I found a small campground called Ponderosa Grove just 30 mins northwest of Kanab. The campground has about eight sites that are on a first come first serve basis. I arrived on a Monday night and there were three choices available. By Thursday, all were taken. The sites are in close proximity of one another, but are shaded by junipers and pine which is nice for hot days. Each spot includes a picnic table, grill, fire ring, a generally flat area for a tent and parking area large enough for one to two cars. In addition, the campground includes two pit toilets. Though a little out of the way, I felt like it was a good location as it was only five miles from Coral Sand Dunes State Park, Moqui Cave and Best Friends Animal Shelter. In addition, it wasn’t too far away from town which appealed to me as I was making morning treks in to the BLM Ranger Station to register for the wave and occasionally I wanted a real meal rather than camp food. I likely didn’t have to drive all the way down the side road to this campsite, as the road was surrounded by BLM land where I could have pulled off into a secluded area. Alone and with rain in the forecast, however, I didn’t want to get stuck, so I selected a safer option, that is until I hit a deer. Watch out…they are everywhere!! If camping is not an option, there are a variety of other choices from dumpy motels to cute boutique hotels in Kanab, and even the famous Parry Lodge where all the movie stars such as Roy Rogers, Ronald Reagan, and John Wayne used to stay while filming westerns. I stayed here for one night to get a break from camping, and I was pleasantly surprised. I felt like the famous, yet old lodge might still feel old, but it has been updated enough for a pleasant stay. My room, the Barabara Stanwyck room, included a queen bed, bed side table, desk, closet, refrigerator, microwave and coffee pot. The bathroom was fine, but seemed to be missing an electrical outlet which explained why the plastic base for the hair dryer hung on the wall without the hair dryer. Fortunately, upon my discovery of this, the staff promptly brought me a hair dryer. I also tried out Canyons Lodge for a few days. This hotel, on the edge of town, was more expensive than the Parry Lodge. While the in room decorations trumped those of the Parry Lodge, the room was smaller, didn’t have a closet, and would have truly been cramped with two people. The $84 price included a tasty breakfast, though not as extensive as the options at Parry’s. The breakfast as well as 24 hour front desk were located at its sister hotel, a cute boutique next door. Overall, I liked the extra space at Parry’s, but the quality of this hotel was very nice. I read about Peekaboo in the Lonely Planet Southwest USA Travel Guide. Though listed, it didn’t have a * by it, so I wasn’t sure what to expect. What I did know, is that I wanted greens after snacking on dried food all day, and the book made it sound like this restaurant was the best option in Kanab. I ended up ordering the quinoa, portobello burger with a side salad which was lovely. Not only was the food good, but the service was FAST. Granted I was eating at 5pm so that may have had something to do with it. I eyed the menu to return a second time though, which I don’t do much, as I like to try different places. In this case, however, the menu matched my restricted diet, and I ended up with a 10% off coupon after taking the Best Friends Animal Society tour so a few days later I was back trying a healthy pizza. This bakery is very small with only about 6 bar stools indoors as well as an outdoor patio. I arrived hoping for a cup of tea and a cozy spot to write my blog given it was a rainy day, but it wasn’t terribly conducive to my needs. Regardless, the mint tea was excellent and the artisan breads, omelettes and crepes looked fantastic. I learned about the Angel Village Café at Best Friends Animal Society after taking a tour at their facility. The tour guide claimed the whole town ate there. Judging from the parking lot, this may have been true! The café serves a $5 all you can eat buffet and salad bar from 11:30 to 1pm. I arrived at 12:30 and literally squeezed into the last spot in the parking area. If I had to do it over again, I would have come earlier as I timed it perfectly for scraps, no forks, and no inside tables (and it was cold outside). Having said that, everything did get refilled, but I was finished eating by then as I shoveled my food in my mouth so I could go back inside! Some people say the food, which is all vegan (you can imagine my surprise when “jerk chicken” was on the menu), is free and $5 is for the view. I didn’t try the soy based jerk chicken, but the view was spectacular. I think I would have liked the café much better had I timed my arrival better as the salad bar was good and the cherry cobbler was awesome. And at least I was supporting this no kill animal shelter, though I’m not sure $5 covers more than costs. Sego Restaurant is a part of Canyons Boutique Hotel, the sister hotel to Canyons Lodge. This restaurant rivals any restaurant in Denver both in excellent plates and expensive price. Sego serves a tapas style menu and two plates for approximately $40 without alcohol feeds one person. Though pricey, the food was devine. I visited this restaurant twice and ordered the scallops, the shrimp, brie and fig toast, and artichoke and mushroom toast. All were outstanding, though the shrimp might have been the best. The service earns 5 stars too, as the server remembered me from a few nights earlier. I was stunned to see that the Best Friends Animal Society was the number one place to visit in Kanab on Trip Advisor when world famous hikes surround this area. Its reviews intrigued me to join a scheduled 1.5 hour tour. I learned so much about this magnificent place and its incredible mission…to make the entire USA no kill by 2025. They are on there way to making this happen. Dogs in Utah are already protected, and next year the entire state will be no kill. If only they could protect deer from running into cars! The facility in Kanab is the largest no kill shelter in the USA. It is home to 1,700 animals including rabbits, birds, pigs, goats, horses, dogs and cats. It sits on 20,700 acres, 3,700 which is owned and the rest leased from state and federal agencies. There are a handful of hikes, RV areas, and even cabins where volunteers may stay the night with their pet of choice. If I had to do it over again, I likely would have set aside a whole day and night here, though it requires planning as it books up several months in advance. The museum and trading post is free to enter. Behind the gift shop, is an outdoor area full of buildings from different western movies. The doors are low in many of the buildings to make the movie stars look taller. Anyway, for movies buffs, it is worth a quick stop! The amount of BLM land surrounding Kanab is astounding. It goes in every direction. After waiting through the lottery process for the Wave and not winning the permit, I headed out for another hike which stars at the same trailhead. I drove the dirt road to the trailhead, paid my $6 permit fee, and began my hike through Wire Pass Canyon to Buckskin Gulch Canyon in Grand Staircase National Monument. Wire Pass is the narrowest canyon in the southwest and Buckskin Gulch is the longest and deepest. It is only 1.7 miles from Wire Pass to Buckskin Gulch at which point petroglyphs dot the canyon walls. Here, hikers can go right or left, though going right to the narrower portion of the canyon is most popular. There is a lot of stagnant water, so bring the proper footwear. There was quite a lot of mud and water from a recent storm the day I visited with only one pair of trail shoes on hand, thus I didn’t make it very far which made for a somewhat long drive and pricey permit for less than two hours in the wilderness. If BLM land and forest is too rugged feeling, then find a hike in a National Park. There three national parks (Zion, Bryce, and the North Rim of the Grand Canyon) within 75 miles of Kanab! With Zion National Park being the closest, I took a hike through the world famous Narrows. Aside from the first mile of paved trail, the rest of the hike requires wading through a river. The river was only running at about 39 cfs which was nice as I was able to make it to many of the highlighted features on the trail such as Mystery Canyon Waterfall, House Rock, Orderville Junction, Floating Rock, Wall Street and the Boulders in shin to crotch deep water before I turned around. The outfitters who rent sturdy boots, neoprene socks, and dry pants which I highly recommend in the fall when the water is cold and the sun is limited said if I wanted to make it to Big Spring, I would have to wade through chest deep water or possibly swim. This didn’t make my list of things to do, but I met three guys who camped and hiked the Narrows from top down (which requires a permit) who were discouraged from going by the ranger due to high water, and they said it never got above waist deep. Oh well, I’ll have to try again to get farther, but I felt pretty satisfied after hiking 5-6 hours while exploring a portion of the side canyon at Orderville Junction as well. Anyone who likes rocks and relics should stop by Moqui Cave which now operates as a museum. Originally, the cave operated as a dance hall and bar. Patrons could drink in one room and listen to live music and dance in the other. Always with a museum in mind, the owner converted the bar to a place that exhibits his life collections of arrowheads, fossils, dinosaur tracks, and fluorescent minerals, most of which are from the area. The $6 entry fee provides 20 minutes of entertainment. 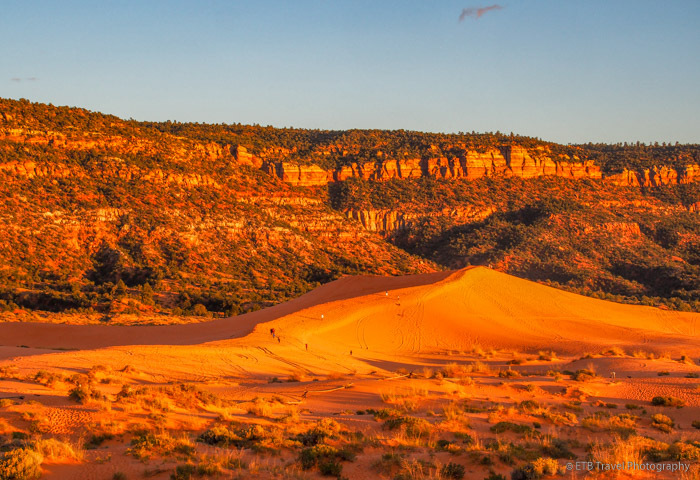 The Coral Pink Sand Dunes State Park is located about 20 miles outside of Kanab. To make the $8 admission more affordable, in addition to watching the sunset, arrive a few hours earlier to walk along the sand dunes which also happen to be very popular for the OHV enthusiasts. Dune buggies zoom across 1,200 acres of coral sand. It is also possible to pull off the side of the road before reaching the park for a nice sunset picture which might be a better option if that is the only goal. Click HERE for an offline GPS guided article om the GPSMyCity Travel App. Love reading your posts about the best of America during this time of trouble…. Thanks Kim. You might like reading the book Factfulness. It is written by a Swedish author and uses UN data. It shows how great the world is despite all the negative reporting. It’s very interesting as there is a 13 question quiz and we humans (including the most educated) on average only get 2 answers right. Less than chimpanzees. I got about 6 right so I was feeling pretty good, but I think that might be because of travel. Regardless, it makes you feel a little more optimistic about the world. Has nothing to do with politics. One of Bill Gates favorite books. You might like it and score well with your travels. Hope you are well!